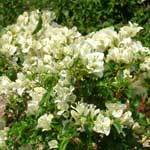 It is a highly variegated variety with green leaves heavily overlaid with ivory. The large flowers are white with a blush pink overlay as they are opening. Is a distinctive Bambino. 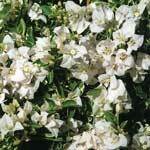 It is a vigorous variety with strong yellow stems holding the leaves and flowers aloft, flowers are pure white. 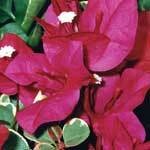 The flowers are bright red and are borne in profusion on mature plants. The most unusual attribute of Bilas is its foliage. All of the new growth emerges as a creamy pink with no sign of green in the leaf at all. It is really such a lack of colour that one would think it would not grow and thrive – but it does. 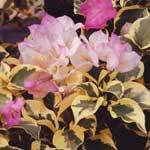 As the leaves age they become variegated, cream and green and even later on develop more green. 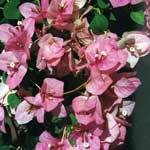 The flowers are a pink/ blue colour borne in terminal bracts above the foliage for most of the year. The plant looks good in windy situations where it withstands the weather well. Is stunning in full flower. The large flower bracts are a rich pink in colour. They will completely cover the bush when the plant is in full growth. Bokay likes to grow in full sun where flowering is heaviest over many months of the year. 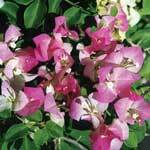 The plant is a very tidy grower which makes it very easy to grow in a large courtyard pot or hanging basket. Tip pruning from time to time is all that is needed to keep the plant compact. Flower bracts appear in vast numbers completely covering the plant in season The leaves of the plant are variegated white and green. When the flowers appear in large numbers they are iridescent orange, the colour contrast is magic. 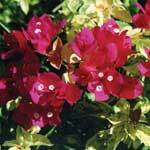 Is a little beauty with brilliant red flowers covering the bush from most of the year. The flowers are borne in huge numbers which completely overpower the bush. Jazzi is best grown in full sun where it will perform at its best. The plant keeps very shapely even without pruning but can be made more compact and full by light tip pruning from time to time. Is a kaleidoscope of colours. Leaves show shades of green, purple, bright pink, pale pink and white at different times of their maturity. Added to this are flowers and bracts in the clearest of tomato reds. Jellibene is a strong grower, it sends up quite a few long shoots from the base of the plant. When it is grown in landscape situations in the garden, these need removing. This attribute makes it ideal however for courtyard pots and for training as formal standards. 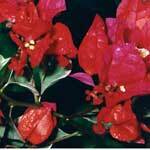 Is a distinctive variegated foliaged bambino with brilliant scarlet flowers to add to the collection. 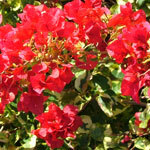 The flowers are a bright scarlet red borne in terminal bracts above the foliage for most of the year. The plant is similar to Raspberry Ice but more dwarf as it is a sport of Arora, a dwarf form. Likes warmer areas. It grows to 50-60cm in height with a spread of around 1m making a truly dwarf form. Leaves are highly variegated with yellow splashes. Kikori likes to grow in full sun for best flowering. As it flowers in warmer weather planting in full sun is best. It is a tidy grower doing well as a border plant. Tip pruning from time to time is needed. Is one of the easiest Bambinos to grow. The plant, with its lime green leaves, spills over itself as it grows. The beautiful lavender pink flowers hold on the plant for a long time. Krishna is a strong grower which will need pruning several times throughout the growing season. Long shoots that occasionally appear need removing at the base to keep the plant tidy. Is another of the “Bambino” range with it’s Multicoloured flowers, they are pink and white and are borne by the plant in great confusion over many months of the year. Majik goes best in full sun. In shady areas while it will grow all right it does not flower as well. It is another of the “Bambino” collection that sends up long shoots from the base which need removal as they appear. If this is done the plant is easily kept to a nice compact and full shape. If planted in a drift amongst others of the collection it does well and stands out. Majik flowers heavily all over the bush, completely covering the foliage from time to time with short rests between the bursts of flower. Is one of the more unusual of the “Bambino’s” because of its Multicoloured flowers. Flowers are all shades of Mauve through to White with shades between. They are borne in huge numbers all over the plants but are not continuous – the plant smothers in flower and then has a short rest before coming back into full flower again. Best grown in the full sun position where it can be grown as a formal hedge — stunning when in flower. Has to be one of the best container grown plants available. 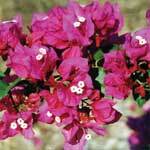 It has a distinctive purple red flowers which are borne in terminal heads over the bush. Flower heads need removing as they fade. This starts another burst of blooms. The plant looks good in sunny situations where it stands most weather. Is a really stunning plant when in flower. The leaves of the plant are variegated white and green, when the flowers appear in large numbers they are Iridescent Orange, the colour contrast is magic. Miski likes to grow in full sun where flowering is heaviest over many months of the year. 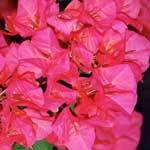 The plant is a very tidy grower which makes it very easy to grow in a large courtyard pot or hanging basket. Tip pruning from time to time is all that is needed to keep the plant compact. Is a distinctive flower colour. The flower bracts are a bright lolly pink. These heads are borne as usual on terminal heads around the plants during the warmer months. The plant looks good in sunny situations where it stands most weather. 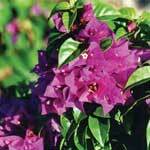 Has a flower of Bright Mauve/ Lavender. Nonya is best grown in full sun and is really best if it is pruned regularly removing completely any long shoots that come up out of the bush as they appear. If this is done regularly the plant is easy to maintain. Shows the shimmer of stunning white flowers covering the foliage of dark green leaves which have a solid white margin. 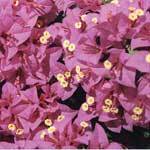 It is an excellent ground cover which can be easily kept below 50cm in height and whatever width, up to 1m in diameter as needed. The plant loves full sun and thrives in hot spots in the garden or in the courtyard where even the reflected heat of the tiles is not too much for it to grow well. 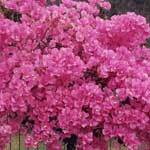 It is easily kept to a dense compact shape by tip pruning. 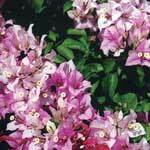 Is an excellent choice for garden planting or for large courtyard pots. The brick red bracts and flowers cover the bush in abundance for many months of the year. Plants of PedroA can be kept compact with little effort, it is important to cut out any long shoots that come out of the bush during the growing season. This pruning will keep the plant to the size you require with little extra effort. 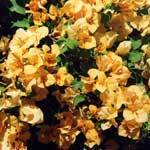 Has striking golden bracts and flowers for many months of the year. Siggi is best grown in full sun where flowering is so heavy that it is almost impossible to see the bush. Siggi is a tidy grower and does not need much pruning to keep it to a compact shape. Tip prune from time to time and remove the few large shoots which come out of the bush occasionally. Is a stunning plant when in flower. The flower bracts are a mottled pink. These heads are borne in terminal clusters around the plants during the warmer months. The plant looks good in sunny situations where it stands most weather. Is a stunning plant when in flower. The purple flowers are held on longer stems than other Bambinos giving a longer stemmed plant suitable for taller borders and tall hedges . The plant looks good in sunny situations where it stands most weather. 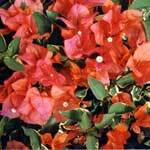 Is a strong grower and is suitable for garden planting and for large Courtyard Pots. 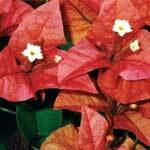 The flowers are Claret Red which are particularly striking because of the variegated foliage of the plant. The new growth has touches of pink on the green leaves which fade out to white as the leaves age. Flowering continues for many months of the year. 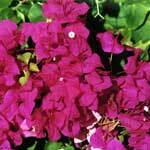 Zuki will grow in more shade the most Bougainvilleas and will flower reasonably well. 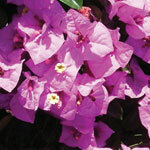 The plant is a tidy grower making it very easy to keep to the size you require. 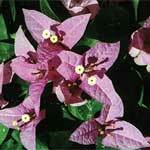 Is a stunning plant when covered with it’s purple bracts and flower. 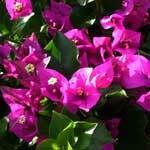 The flowers are persistent, at most times you can find flower on the plants and the leaves are a deep green. The purple flowers cover the bushes. The plant looks good in sunny situations where it stands most weather. 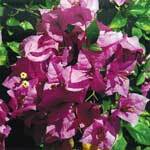 Bougainvilleas have been capturing the hearts of gardeners worldwide, picture the streets of Santorini, Greece, where the white and blue buildings spread far and wide, the dots of colour lining windows, archways and fence lines are often bougainvilleas. Check out a few photos from around the world here. 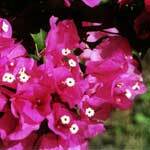 The Bougainvillea is a lesser appreciated wedding flower. The striking colours can make stunning additions to your special day from bouquets to wedding arches to cake toppers. Take a look at some wedding day uses here.